The Word Processor program provides a way for you to create and save form letters, to use or edit our form templates, or to use the Tenant File database with any letter you create. It is easy to use with familiar Word Processor commands and features. This is a Tenant letter that can be edited to suite your needs. You can navigate through your Tenant List, Find a Tenant directly, or add more Tenant related fields. When creating a merge letter, you can select options to create past due notices, expired lease notices, using the criteria shown above. Create your own customized letters and save. 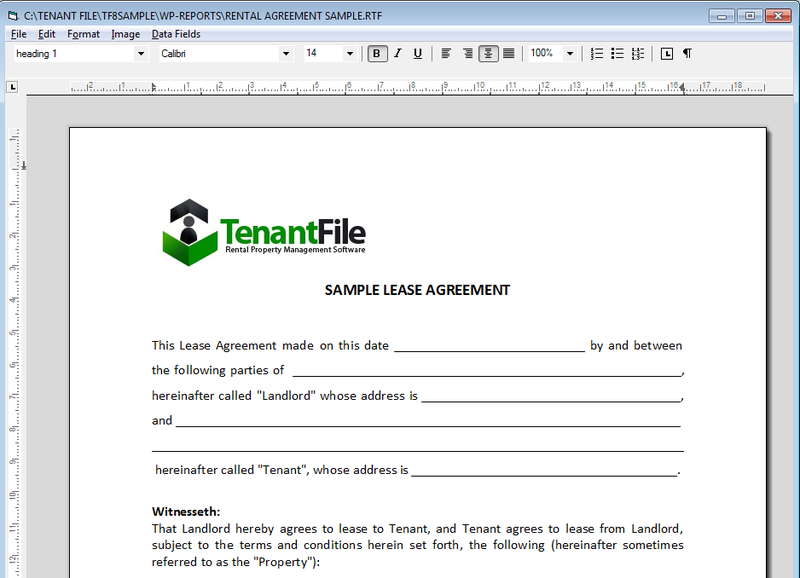 At Tenant File, we have made it easy to create and edit documents that you can send to your owners, tenants, and vendors. The Word Processor looks and feels like a common word processor that most people are already familiar with, and it uses the standard icons for most actions. 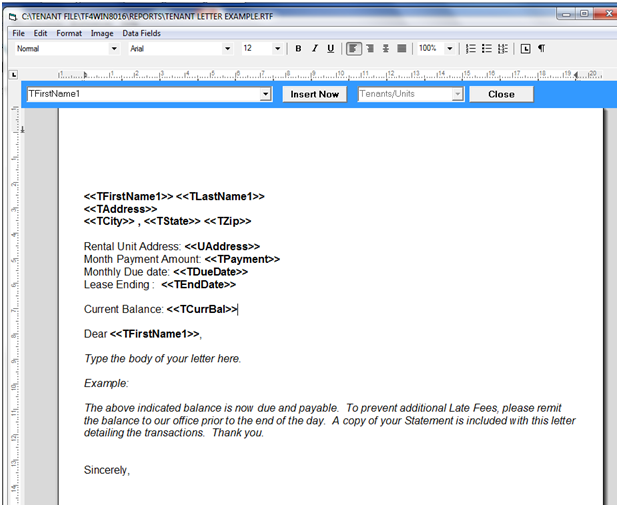 You are able to change fonts, type size, and insert graphics into your documents, such as for a letterhead or brochure. 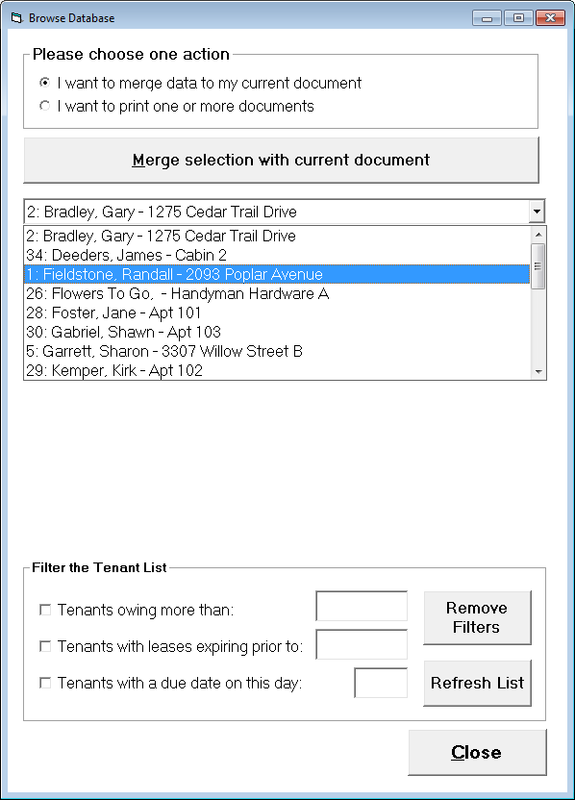 The Tenant File Word Processor uses the fields that are already in the program, and allows you to insert them anywhere into your document. Not only that, but you can also filter the data to produce documents meeting specific criteria, such as 'tenants owing more than a certain amount of rent', or 'tenants with a lease expiring prior to a specific date'. This Tenant File Word Processor is intuitive and easy to use. Not only can you create your own documents, but we have also provided over 100 documents that you can use the way they are, or modify and save under a different name. The Word Processor is only $149.95! This includes 100+ additional PROPERTY MANAGEMENT FORMS to make your property management business more efficient!